I’ve been playing through the same bass amplifier for over 20 years. I never played large venues, and back when I was still gigging regularly we mostly played bars and small clubs, so I never really needed more power than the 100W Marshall amp I had, It was a combo amp, solid as a rock, and in its lifetime it tumbled down a flight of stairs on two separate occasions, was dropped numerous times as a fatigued and sleepy bass player carried it back to his car in the wee hours. It also never had a day’s service in its life, the pots are a little bit scratchy now but it still functions perfectly. The problem was, it never had the sound I was looking for. As with any instrument, player ability impacts the sound to some extent, but less so in an amplified instrument. My basses sounded really good through it, but I had to use a few effects pedals, compressor, limiter, bass EQ just to get the sound I wanted. I decided (finally) that I would get a new amp, did tons of research and settled on the tiny Gallien Krueger MB200. 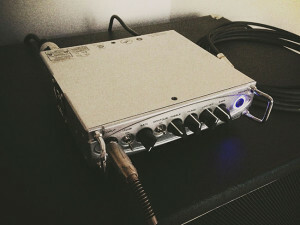 What actually sold the GK was the little amp simulator I have on my iPad, which is based on it, and I loved the sound. This little amp is tiny, barely larger than a car radio, puts out 200W of power, and I have paired it with a 2X10 Ashdown speaker cab. The sound is, quite simply, phenomenal. It pushes all my buttons, flat EQ settings are bright enough for both my Jazz bass and the 5-string Warwick, and I can dial in some very decent growl and grit if I tweak the settings somewhat. Love this little thing, am barely playing at quarter volume, and it’s already rattling the windows.